The E-M10 Mark II offers genuine OM-D imaging power in a remarkably compact, lightweight and classy body, which makes it easy to carry and capture first-class stills and videos on the fly - no matter where you are or what you’re wearing. For shooting with a large telephoto lens, the optional quick-release camera grip adds another reassuring element of stability. But the latest OM-D wasn’t just designed for portability. It’s clearly intended as a design statement in itself. No matter which side of the camera you’re standing, the eye is immediately drawn to the dials, with their glinting chrome and milled edges. Their position on the top right of the body and their extratall, chunky dimensions makes them much easier to operate. Together with the retro-styled On/Off switch and the central finder, the dials and reassuringly solid, all-metal build ensure anyone picking up the E-M10 Mark II is likely to look and feel like a serious hobby photographer. Good looks are nothing without performance, and the E-M10 Mark II backs up its sleek design with the striking imaging power you’d expect of Olympus’ top-flight camera range, especially on the move or in low light. This is when Olympus’ celebrated 5-axis IS comes into play. It eliminates the blur caused by camera-shake in virtually any shooting situation – from shift movements with macros to angular shake with telephoto lenses, or rolling at night. 5-axis IS works irrespective of the lens attached and compensates admirably for up to four steps of shutter speed**. Even movies recorded one-handed come out blur-free. The E-M10 Mark II has a large, high-speed, 2,360K-dots OLED EVF with an unrivalled 100% field of view, which proves invaluable for framing shots and assessing light in difficult conditions. The EVF displays the full range of manual settings and optional effects in real time to give you full control over the impact of your adjustments. You can fine-tune the Colour Creator, Highlight, Shadow and Aspect Control, or get even more creative by applying one of 14 Art Filters and 9 Art Effects. For fast and easy focus adjustment, shooting at awkward angles, or simply reviewing and selecting images to share via Wi-Fi and your smartphone, the OM-D E-M10 Mark II is equipped with a large, 3-inch touchscreen LCD with pad control - for easy, touch focussing on the LCD while using the EVF. Another highlight of the display is the fingerprint-resistant coating that keeps it free of smears that might otherwise spoil the camera’s handsome looks - or a slideshow of your best shots. 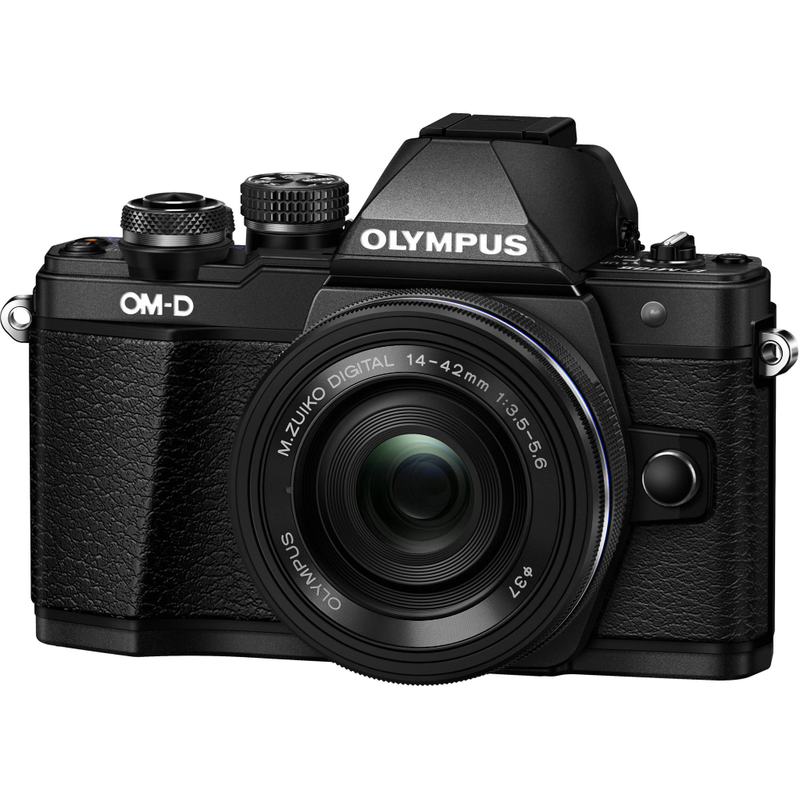 To satisfy the creative ambitions of OM-D owners, Olympus offers an everexpanding family of accessories and more than 40 high-grade Micro Four Thirds lenses that cover the full range, from hobby to pro. The Olympus 14-42mm f3.5-5.6 EZ M.ZUIKO lens with electronic zoom (EZ) perfectly complements the OM-D and PEN range in size, style and performance, delivering crisp, edge-to-edge quality throughout the entire zoom range. When attached to a compact system camera with built-in Wi-Fi users can control the 3x electronic zoom from a smartphone or tablet and view what the camera sees in Live View mode, which is particularly useful for capturing group family portraits at special events. At the wide end of the focal length the lens offers a minimum focusing distance of 20cm making it great for close-up portraits and dynamic nature shots. Suitable for everyday picture taking, the extremely lightweight (93g) 14-42mm EZ lens with quiet autofocus zoom operation can be adjusted manually for smooth, precise control.